If you love customizing your device and you’re into dark themes, Swift Installer will be a game changer for you! This new custom theme engine brings customization to the next level while keeping things super simple. Backgrounds, accents, system icons and notifications: everything you need is packed inside this powerful tool. Let’s get into it this amazing heme engine for Android! 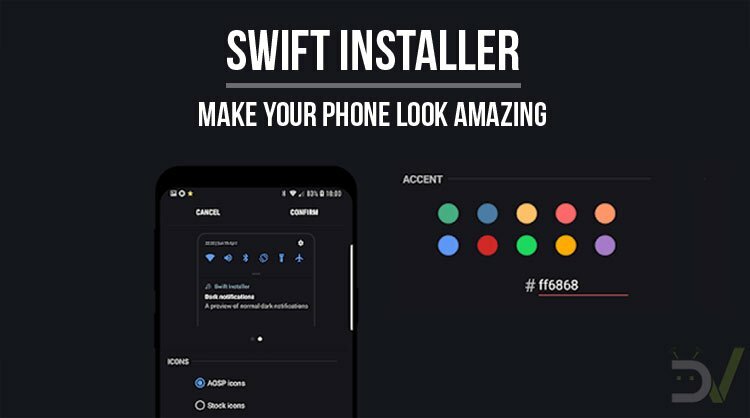 Swift Installer has been released by Per Lycke and Davide Lilli, the same great devs who have created the Swift Substratum themes – some of the most diffused and loved ones out there. Since their release, all the themes have been supported with fast and frequent updates. All the hard work pays back and you can get any theme with peace of mind thanks to the proven reliability. Swift Installer is a project started in the first semester of 2018 as an Unreleased App, so alpha testers could report any issues directly to the devs. After many months of hard work, this awesome theme engine is finally ready to be released officially. The price is 1.99$ for the US, 1.99€ for Europe, 1.69£ for the UK and ₹99 in India. At the time of publishing this article, some countries could be still waiting for the public release. Don’t worry if you see “Unreleased” on the Play Store page, it will work just fine and you’ll receive the public update very soon! Swift Installer is fully compatible with Samsung Experience, AOSP and Oxygen OS. 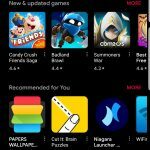 It will require root access in order to work on AOSP and Oxygen OS, but you’ll be free to use it on unrooted Samsung devices. The last requirement is having a device running Oreo 8.0 or higher. For users on AOSP and Oxygen OS rooted with Magisk, there is a special module available to download directly from the three-dots menu inside Swift Installer. Setting up the Swift Installer is extremely easy. Once you download the app, you’ll be presented with a guided tutorial. This part will require you to grant the essential permissions in order to function properly. The OS you’re running will be recognized automatically and the app will ask for root access in case it’s required. Once you’re done with the permissions, you can go straight to the more interesting part: customization! This page contains all the possible options to obtain the result you love the most. You’ll find a preview of the final result at the top of the screen, before applying the theme. There are various styles and options to try, the limit is your imagination! There are some suggested background and accent colors, but you can also pick your own. Custom colors can be entered as hex codes, which you can retrieve in a few different ways. On a PC you can extract the code from an image with the picker tool in most editing programs. If you want to do this on your smartphone, the easiest way is using Color Picker (link below). 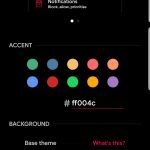 If you’re interested in the candy red accent color in the screenshots, the code is #FF004C. After choosing the look you want, the last thing to do is installing the overlays. This part can be more or less annoying depending on the device you’re using. First of all, you’ll see a list of all the apps that can be themed among the installed ones. Make sure to pick the ones you want to theme, or simply select all of them. Once you’re done just tap the big button and the install process will begin. On rooted devices, this will be done automatically and you’ll just need to be patient. Instead, if you’re on Samsung Experience, you’ll need to install all overlays manually. This could be a bit annoying, but keep in mind you’ll only need to do it once. After installing all overlays you just need to restart the device and enjoy the result! Changing the looks of your device is very quick and simple after you install all overlays. If you want to change something, you’ll just need to go to the customization menu. After you applied the wanted changes you’ll need to tap the button to install them. The best part is that this only requires one single overlay to be installed! Once done, simply restart your device and enjoy your new theme on all the apps you have chosen. Swift Installer receives updates very frequently to ensure compatibility with all included apps. You’ll find all the available updates inside the dedicated tab in the overlay menu. If the current version of one of your apps isn’t supported yet, the app will suggest removing the overlay. You will be able to add it back once you receive the next Swift Installer update. Updates are very quick because you only need to install the individually updated overlays. Once done, simply restart the device as suggested. Until you do that, you’ll be able to use the apps without any theme on them. If you encounter any issues (for example an app force closing), it may be due to an incompatible overlay. If you decide you want to remove a theme from a specific app, simply go into the overlays menu. Here you’ll also be able to install overlays for newly installed apps. 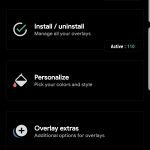 Please note that uninstalling overlays doesn’t require to restart your device afterward. Theming your system can be very dangerous if you don’t know how to recover your device. In order to stay safe, always uninstall all overlays before installing a system update. If you fail to do so, you could be unable to use your device after the update is complete. You will be able to safely re-apply the overlays once your system is updated. Keep in mind that this can also apply to the monthly security patches. We cannot responsible for any damage or data loss, be careful! 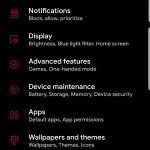 Quick note for Samsung users: don’t use Ultra Power Saving mode with any theme. 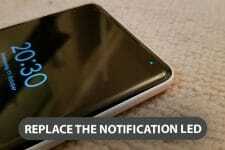 Doing so will result in the theme being removed and the device potentially becoming unusable. In the unfortunate case you end up messing up the device, it’s better to be prepared. 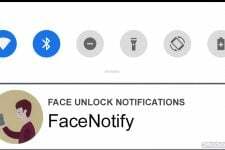 In case you’re not ready, your only option would be doing a factory reset: this would solve the issue, but all your data, apps and settings will be lost. Instead, the best option is using the official rescue script: it is an automated series of ADB commands collected in a batch file. This is a safe solution to remove all overlays, thus recovering your device. If ADB has been set up properly, you’ll be able to run the script on a previously allowed PC. You just need to download the zipped archive, extract it and go to the needed folder. If you’re on Windows you’ll need to run the batch file. Instead, on Linux and MacOS you’ll have to use the SH script. You can do this from the lockscreen if you can start the system. Otherwise, you can boot into Fastboot mode.